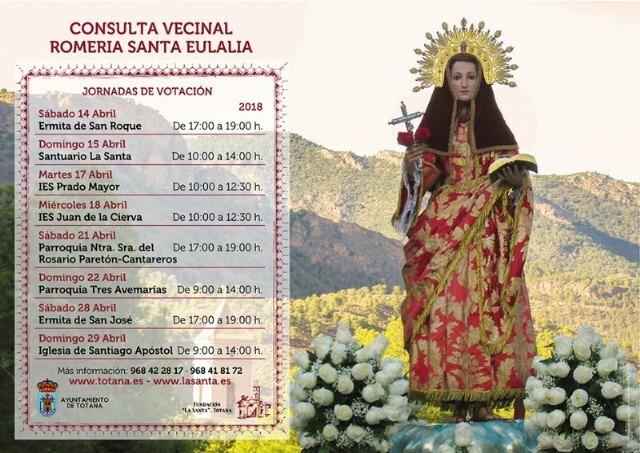 The Board of Trustees of the La Santa de Totana Foundation, in collaboration with the City Council, is starting this weekend the planned local consultation in order to know the popular feeling about the day of the celebration of the Santa Eulalia rise in pilgrimage, face to the year 2020. 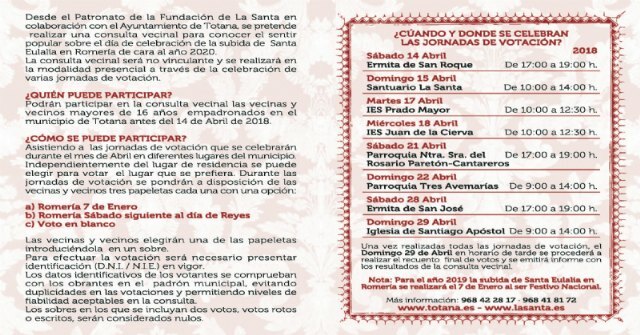 The procedure will have the guidance of the municipal technicians of the Department of Citizen Participation, and it will be able to participate the neighbors over 16 years registered in the municipality of Totana before April 14, 2018.
and will continue tomorrow Sunday at the Sanctuary of La Santa, from 10:00 a.m. to 2:00 p.m., respectively. Tuesday, April 17, IES Prado Mayor, from 10:00 a.m. to 12:30 a.m.
Wednesday, April 18, IES Juan de la Cierva from 10:00 a.m. to 12:30 a.m.
Saturday, April 21st, Parroquia Nuestra Señora del Rosario Paretón-Cantareros, from 5:00 p.m. to 7:00 p.m.
Sunday, April 22, Parish Three Hail Marys, from 9:00 a.m. to 2:00 p.m.
Saturday, April 28, Hermitage of San José, from 5:00 p.m. to 7:00 p.m.
Sunday, April 29, Santiago Apóstol Parish, from 9:00 a.m. to 2:00 p.m.
On this day of voting will be available to residents and three ballots with the following alternatives: pilgrimage January 7, pilgrimage Saturday after the day of Kings and vote blank. and the required requirement to be able to carry out the voting is the presentation of the DNI OR NIE in force. Envelopes that include two votes, broken or written votes will be considered void. Once all the voting days have been held, on Sunday, April 29, the final vote count will be carried out in the afternoon and the results will be issued. 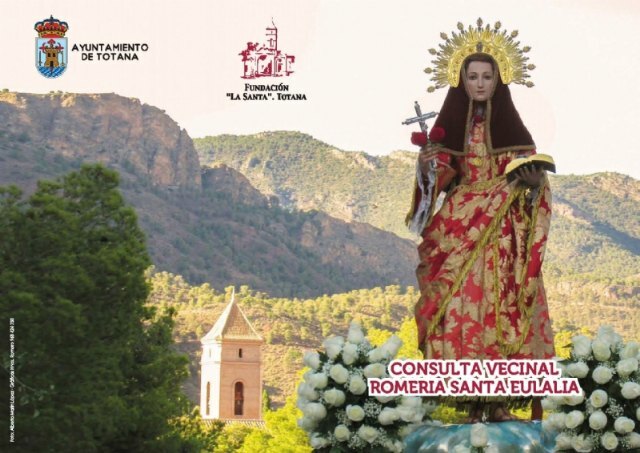 For the year 2019 the pilgrimage of Santa Eulalia rise will be held on January 7 that will be national holiday. People who have questions can request more information through the Board of La Santa or the Department of Citizen Participation of the City of Totana.